Some games will require them for saves while others won't be able to use them at all. We're excited about PlayStations new handheld. It's amazing looking and it packs some exciting new technology that could either be brilliant or useless, but hey, it's new. There's a bit of confusion though, on just how game saves will work. 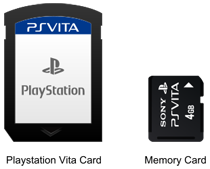 The Vita is a cartridge based system, which means you'll be able to save your games directly on the cartridge that it comes on, right? Well that depends on the game. Some of them fill the cartridge and require an external card for saves. If that seems pretty cut and dry, here's where it gets a little weird. Games that do allow you to save on the cartridge itself will not allow you to save to an external card. It's not that they save to the cartridge by default - they only save to the cartridge.